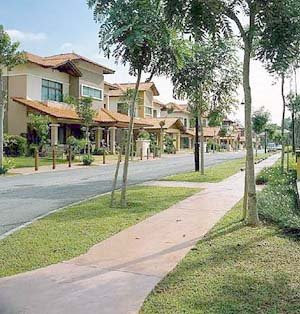 Pedestrian-friendly streets with pockets of green in Duta Nusantara, Sri Hartamas, developed by SP Setia. Developers believe landed gated and guarded (G&G) projects are preferred for two main reasons: security and community living. However, they are quick to add that nothing is fool-proof. All the developers spoken to have, at one time or another, promoted – or are promoting – G&G living. Developers interviewed, either by e-mail or visits, are E&O group (projects: Seventy Damansara, Idamansara, Seri Tanjung Pinang in Penang), Perdana ParkCity Sdn Bhd (Desa ParkCity), Glomac Bhd (Aman Suria), S P Setia Bhd (Setia Eco Park) and TA group (Idaman Villas and Damansara Idaman). E&O marketing & sales director K.C. Chong: G&G offers residents a more managed living environment, with features like security, privacy, landscaping and communal facilities. Residents can wander around easily, without worrying about speeding cars. Many of the better-managed residential estates organise social activities which help foster stronger communal links. This bond helps in enhancing the security aspects of the community. The larger ones are usually masterplanned. Residents have prior knowledge of what’s in store in their neighbourhood, unlike non-master planned developments where you may see a set of commercial shophouses coming up after you have moved in. Well-designed and well-managed gated developments also tend to have strict rules on issues such as regulations and working hours for construction and renovation works, and building guidelines. A prevalent feature is the very attractive landscaping incorporated in the streetscapes. Most of this landscaping are well maintained as the funds for doing this comes from the service charges which each homeowner pays into the communal funds. SP Setia Bhd CEO and group MD Tan Sri Liew Kee Sin: Although G&G communities have started off as upscale developments, its popularity has resulted in many adaptations of the concept to cater to the needs of a broader segment of the market. In masterplanning our Setia Alam project, we created small clusters of homes with only one single road entry/exit point. This is to facilitate the establishment later of a simple-security structure at relatively low cost such as a boom gate by the housebuyers themselves. Some of our other projects are guarded but not gated. Essentially, there are different levels of security offered to meet the different needs of each segment of the market. At the highest level, the provision of perimeter fencing, CCTV and 24-hour security service will obviously involve quite a lot of expense. However, buyers can also choose less sophisticated options to suit their requirements. Perdana ParkCity sales director Susan Tan: Communal facilities can be sustained with the force of law. The community concept is based on shared cost, which in turn, depends on the standard of services expected. With the provision of joint management corporation, provided for under the Strata Titles Act, property owners will decide on how much, and where, to spend. However to reduce the maintenance cost, we feel that the local authorities should consider granting reduced assessments for such projects since maintenance of the internal roads, landscaping and facilities are borne by the residents and are no longer the responsibilities of the local authority. Chong: Key security measures include a robust and well trained security force. Surveillance equipment must be in working condition at all times. Residents can help by taking simple precautions such as informing of expected visitors, reporting untoward incidents, conducting proper screening of employees and imposing a no-visitor rule for their helpers. The maintenance cost will commensurate with the range of amenities and services provided including the level of sophistication of the management and security systems. Potential owners/residents will need to assess their own requirements against the price that they are willing to pay. Usually more experienced developers would set up, almost at the outset, residents associations on home owners associations, to involve the homeowners, which in turn decide on the level and quality of services they are comfortable with. More often than not, these residents choose to increase the level of expenditure on essential facilities such as security and management of common facilities. Tan: G&G projects are no different from condominium projects. Locking up the unit when they leave the house and activating the home security system should not be dismissed as unnecessary. Chong: In many ways, gated communities are run very much the same way as condominiums. The difference lies in the attention given to the larger landscape of the residential estate, which could mean more grounds to cover for the security personnel and more landscaping. Running costs may not necessarily be higher, because there are usually no lifts to maintain, no air-conditioned lobbies. The success of both types of developments depends essentially on the quality of management, set up initially by the developer, and is subsequently administered by the resident association. A very important management tool is the Deed of Mutual Covenant, a document which the developer usually signs with the first purchaser, and subsequent house owners, which prescribes the way the development is managed. It usually contains house rules, guidelines on house renovations, the administration of the community funds (collected from monthly service charges) election of office bearers, etc. The quality of the development does depend largely on the manner in which this management tool is utilised, for the ultimate benefit of the community. Liew: It is a totally different product type and lifestyle living concept which appeals to a totally different group of buyers. On this note, it has to be said that buyers today are extremely well informed and increasingly sophisticated. Choices are made based on their individual needs, tastes and preferences as such it may be somewhat simplistic to merely differentiate between the two. Glomac Bhd group executive vice-chairman Datuk Richard Fong: We are opening registration for 200 units of gated and guarded housing in Bangi. Our buyers are happy with Aman Suria. Since we handed the keys over to buyers, there have been no break-ins. SP Setia to buy 3 PNB units? SP Setia Bhd, the country's biggest property developer, may acquire three real-estate companies from a state asset manager, increasing sales and gaining financial backing from the government, says RHB Research Institute Sdn Bhd. SP Setia will benefit if Permodalan Nasional Bhd (PNB) sells three property units it is already planning to merge to SP Setia, in which PNB already owns shares, said RHB Research, the brokerage unit of RHB Capital Bhd, the country's fourth biggest bank. Adding Island & Peninsular Bhd, Pelangi Bhd and Petaling Garden Bhd will enhance SP Setia's value and provide it with strong financial backing from the state for expansion, RHB Research said. Malaysian developers' sales slumped last year as the country's exports fell, slowing economic growth, and the global financial crisis dried up credit. PNB's three property units have combined annual sales exceeding RM1.31 billion, similar to SP Setia's 2008 figures. SP Setia "could be pulled in to spearhead the merger in view of its strong brand name and market leader position in the local property industry", RHB Research said in a report yesterday. It maintained an "underperform" rating on the stock. "A mega property company could also potentially benefit from merger synergies in terms of centralised procurement of construction materials and better negotiating power with contractors," it said. Loans approved for residential property rose to RM3.74 billion in February, the first increase in seven months, central bank data show. SP Setia chief executive officer Tan Sri Liew Kee Sin and company spokesman Diana Chin were not immediately available to comment when Bloomberg called the company. PNB holds a 6.5 per cent stake in SP Setia as of January 30, according to data compiled by Bloomberg. What makes a landed, gated and guarded project? ON April 4, John left his semi-detached home in Kota Damansara, Petaling Jaya, at 6.30am. He returned at about 1pm to find that it has been broken into. He lost RM45,000 and was badly traumatised, not so much by the loss but by the invasion into his private domain. John, 64, from Britain, says this is a gated and guarded (G&G) development and he pays about RM950 annually for the security service and maintenance. As a result of that incident, he has extended the wall behind his house by another five feet, bringing it to nine feet. He has also installed an alarm system. He suspects the thief or thieves must have climbed over the wall which separates his house from the public road. “I’m thankful my wife and daughter were not at home when they broke in,” he says. He and his family have been staying there for about two years. The project has about 300 houses. In another project in Damansara Heights, one of the most upmarket residential suburbs in Kuala Lumpur, a relatively new development of about 18 months had three break-ins. The weak point in this G&G development was also a wall which was relatively low compared with the other retaining walls that encompassed the project. The police were called in and a camera was subsequently installed on that wall. “No one was hurt. It was the work of some petty thieves,” says a source from the company. The break-ins in both the above two projects bring into focus several issues. The desire and need for security has resulted in various adaptation of the G&G concept. In John’s case, both he and the resident association president think they have bought into a G&G development because there is a perimeter wall and guards. Security presence and a perimeter wall do not constitute a project as a G&G. Conversely, there are some projects which are guarded but not gated. Whatever the adaptations may be, local council approval is needed, even for the installation of a boom gate. It is sad and speaks a lot about the country’s security system if people feel safer behind bars. Country Heights Kajang, for example, is guarded but not gated. Likewise, most parts of Bandar Utama. Seri Beringin in Bukit Damansara, Kuala Lumpur, has a perimeter wall and guards but it is not a G&G project. Because of rising crime rate, Bangsar Baru residents are planning to turn the area into a gated and guarded community by permanently closing off roads and lanes which are accessible to motorists. So what constitutes a G&G project? Other than the perimeter wall and the guards, the G&G project essentially takes care of its own landscaping and amenities like garbage collection and landscaping. The monthly charges go into all these, including the maintenance of a pool, tennis courts and clubhouse, if there are such facilities. Innovative developers have also come up with single entrance/exit as a variant, without it being a G&G project. So, how will a home buyer know if he has bought into a landed strata project, in layman’s terms, a G&G? The only way is to check with the local council or the developer. A word of caution: There are developers who claim their project is a G&G, when it is an adaptation. For many, an adaptation is good enough because security is their chief concern. Many are not bothered if there is a pool or a clubhouse. Incidentally, a new law will be tabled soon to govern G&G developments. Previously, it was just a set of guidelines. The bill will be used on a national level and will help to regulate such properties. The other issue is the community. While John and his family were traumatised by the break-in, the residents’ association president considers it a “minor thing”. Which calls into attention the importance of co-operation among residents. After all, isn’t that what being a community is about? While developers of such projects say G&G is the way to go, Chang says this is just a marketing strategy. “G&G is not something to be encouraged. It segregates the haves and the have-nots. It is a concept, not a deception. There is no legal compulsion to buy; it is just a matter of who can afford the lifestyle that comes with a cost and it appeals to the medium and upper echelons,” he adds. While certain quarters think this is just a marketing ploy to sell a lifestyle, it is undeniable that security and the increasing crime is making people feel more secure behind walls and bars. The Associated Chinese Chambers of Commerce and Industry of Malaysia, in the second half of 2008, reported its findings in a survey that 89% of its respondents were concerned over public safety. It was also reported in the Ninth Malaysia Plan that public safety in Malaysia has deteriorated 21.5% between 1990 and 2004. The crime index rose 15.74% in 2006 from 171,604 cases in 2005 to 198,622 cases in 2006. Property crime made up 70% of the 2006 cases. Landed G&G developments are not unique to Malaysia. There are such projects in the United States, Britain and Europe and Asia. G&G projects initially started out with condominiums, essentially known as strata-titled projects. In Malaysia, concerns about security by home buyers, land issues and the opportunity to profit prompted the start of condominium living. All condominiums are strata developments, but the term strata is not limited to just condominiums today. The desire to be on level ground has resulted in landed-strata development and this is where the landed G&G, and its variation, come in. Seri Beringin, a project by Syarikat Perumahan Pegawai Kerajaan Sdn Bhd (SPPK), was never sold as such. Instead, it has sought the approval of the local authorities, in this case City Hall, to have a perimeter wall and even “donated” a guardhouse. There are other projects in the country which come under this category. To enhance security, some of the residents have proactively grouped together to form a resident association to look into various security measures. Owners are allowed to put up their own barriers, like a higher wall as a form of deterrent – something John did to his Kota Damansara home. For some landed G&G, particularly those in upmarket locations, high monthly rentals of RM10,000 and above has resulted in a large expatriate community. About 70% of Duta Nusantara (by SP Setia Bhd) in Seri Hartamas, Kuala Lumpur are tenanted. Duta Nusantara, comprising mainly semi-detached and bungalow units, are fetching monthly rentals of between RM14,000 and RM18,000, while Duta Tropika, mainly semi-detached and triple-storey terraced, has lower rentals. Seri Beringin, not a G&G project, may be able to fetch rentals of between RM8,000 and RM10,000. This project is new and given time, may fetch higher rentals. In Damansara Heights, Idamansara residences by E&O group are being rented for between RM15,000 and RM18,000, agents say. Whether G&G projects will fetch a premium depends pretty much on location and the set-up. Those located here and with good access, and are managed well, will have a better premium. Whether it promotes community living depends on certain factors including the overall land size of the entire project, the availability of public areas like parks and pools where residents can meet and chat. Smaller projects with a short strip of road with houses facing each other may not be ideal. After all, buyers who opt for this lifestyle also desire communal living, and this means a place to congregate other than by the roadside. The prices of basic necessities such as food, clothes, housing and cars are dramatically higher now compared with those of 50 years ago. Of course, Malaysia today is a lot different than what it was in 1957. Back then, it had 6.28 million people. Today, the population is 27.7 million and our lifestyle has vastly improved. 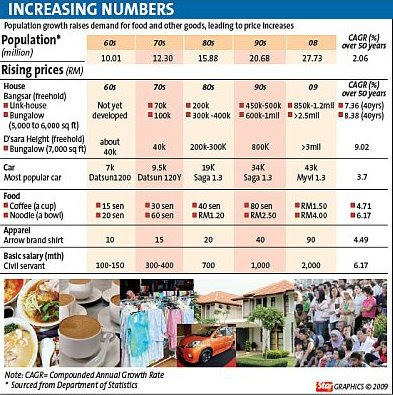 With the strong economic growth since independence, comes the increase in the prices of goods and services. Based on rough calculations, the prices of food, houses, cars and apparel have seen a compounded annual growth rate of between 3.7% and 9.02% over the past 50 years. For instance, a Damansara Heights bungalow with 7,000 sq ft built-up area cost about RM40,000 in the 1960s. It has since appreciated to above RM3mil, given that the location is a prime area in Kuala Lumpur. A popular vehicle in the 1960s, such as the 1.2 litre Datsun 1200, was priced at about RM7,000. Now, the 1.3 litre Perodua Myvi standard model costs RM43,000. It must be noted though that until the 1990s, cars had not come with fancy features such as high-tech fuel injection systems, power steering and windows, airbags and central locking. In the 1960s, people paid 15 sen for a cup of coffee at a restaurant or coffee shop. Today, they have to fork out RM1.20 to RM1.50. That is a compounded annual growth rate of 4.71%. Arrow, an American brand of men’s shirts was sold for about RM10 in the 1960s. The price was gradually increased to RM15 in the 1970s, RM20 in the 1980s and RM40 in the 90s. Now the shirt costs you about RM90 a piece. Do Malaysians’ salary increases match the rising prices? In the 1960s, civil servants earned about RM100 to RM150 a month. Today, their basic salary has reached about RM2,000. That reflects a compounded growth rate of 6.17% over 50 years. However, with the continued rising prices, a father of two who earns a net monthly income of RM3,000 in Malaysia, especially in the Klang Valley, may struggle to stay afloat. After deducting for his EPF contribution, income tax, house and car repayments, and other expenses (meals, petrol, utility and phone bills, daily necessities), he will have little left for savings, if at all. So, while the uptrend in prices is generally seen as a sign that the country is developing fast and that its people enjoy a higher living standard, can Malaysians cope with the high prices of the necessities, especially during a financial crisis? According to a property agent contacted by StarBizWeek, the average salary is actually very far off the affordability mark for house prices, especially in the strategic locations in Klang Valley. “It is a big gap and it is rather difficult for people to catch up with the rising prices,” he says. The policymakers, economists and analysts are not the only ones who hunger for statistics. In the business community, figures are indispensable in just about every aspect. The property and automotive sectors are two obvious examples of businesses that rely significantly on the power of numbers. According to property consultant Knight Frank Research, data and indices relating to property prices, resale values, rental rates and population are of interest to developers, real estate agents and consumers. “These statistics can help the public in making informed decisions. For instance, in the purchase of property as a hedge against inflation, relocation or expansion of business, and the review of business strategies,” it says in an email reply to StarBizWeek. The research outfit’s forecasts are based on, among other things, past years’ price trends, existing and new supply trends, the sales performance of new launches, and general occupancy of existing schemes. To gauge demand, it also talks to agents because they have first-hand knowledge of the market. Real estate agency S.K. Brothers Realty (M) Sdn Bhd concurs that statistics are essential indicators of property demand. General manager Chan Ai Cheng says property players are primarily interested in the level of demand and related factors such as the type, location and affordability. This helps developers to come up with the right products at the right places and prices. “With an awareness of house prices – including the trend and locality – developers and real estate agents will know whether the prices of the houses they are proposing to sell are realistic or otherwise,” she tells StarBizWeek. She says statistics like the property index, stock market indices, supply of property, selling prices, sales performance and vacancy rates are some of the important numbers for the sector. She adds that the data help the players address the supply and demand. Developers who understand the demand will likely enjoy good sales take-up rates. They will also be able to avoid an oversupply situation because they know which products are needed and which ones are coming on stream. Chan says “on the ground” research is preferred because it provides current data needed for immediate decisions. “Numbers are important because they quantify the sentiments experienced by the population. In that sense, it can indicate the depth and extent of a problem. It also serves as a good guide and indicator,” she adds. Malaysian Automotive Association (MAA) president Datuk Aishah Ahmad says car sales numbers are a key indicator of consumer spending because they reflect well the sentiments towards the country’s economy. “After housing, a car is the next single biggest item for many consumers. In good times, the demand for cars will increase and vice versa,” she explains. She points out that the resale values and interest rates are two of the most important factors affecting the industry’s performance. Generally, high resale values stimulate the demand for new vehicles because the owners pay less to upgrade or switch to new vehicles. In addition, they need less financing and this results in lower car instalments. High interest rates mean consumers pay larger monthly instalments and this discourages them from buying new vehicles. “Without the numbers, we are unable to analyse, compare and evaluate the performance of economic activities as numbers enable the objective measurement of activities,” says Aishah. However, she warns that the numbers do not always tell the true story of our social and economic status. For example, most people in urban areas such as the Klang Valley find it hard to accept that the inflation rate is only 2% per annum, she notes. She says the prices of goods have gone up, particularly during the first half of 2008, when the prices of petrol were raised by 40%. With RM100 today, you can buy less than what you could a year ago. “This is how the layman relates to inflation. Perhaps the Government needs to introduce different price indices for the urban and rural areas,” she adds. “We need numbers not just for comparison purposes but also to benchmark ourselves against the industry,” says Datuk Syed Hafiz Syed Abu Bakar, managing director of of Perusahaan Otomobil Kedua Sdn Bhd (Perodua). He says it also benchmarks its sales and service quality with the JD Powers & Associates customer satisfaction index (CSI) and sales satisfaction index (SSI) survey. He says numbers by themselves can also be misleading; how the statistics are derived should be clearly stated. For example, Perodua ViVA, the company’s second best-selling model after the Perodua Myvi, was actually outselling the Myvi in states such as Kelantan, Terengganu, Sabah and Sarawak. Syed Hafidz says that due to the strong demand for new Perodua cars, their resale values are holding well. A 10-year old Kancil is going for between RM6,000 and RM7,000 in the used-car market. “As a car manufacturer, we live and breathe the sales, service and production numbers,” he adds. IF there is a worthwhile lesson from the latest global financial debacle, it is that individuals, governments and business owners must always be prepared to accept uncertainties in life that will throw the best plan out of the window. They must be strong enough to adjust and make the best of things. Although the crisis started out as a US sub-prime loan problem, the speed and magnitude with which it unfolded to decimate and wash out the wealth and achievements of so many countries, citizens and conglomerates, show that the world is growing smaller by the day and we are more inter-related than we care to admit. What we are in today is a big global village, where all citizens, irrespective of their country of origin, are beholden to each other for better or for worse. To stem the rising greed and materialism that have contributed to much of the world’s ills today, the people, governments and businesses should strive to uphold their best virtues and responsibilities to ensure a better world. The fallout from the crisis is certainly a rude awakening for all. Faced with so much uncertainties brought on by the crisis, individuals have to alter their plans, lifestyles and spending habits, including postponing buying decisions and settling for more affordable choices. Likewise, governments should also be prepared to fine-tune and be flexible with their policies so that it is easier for the people and businesses to cope with the difficult times. Although some may say that Malaysia has been spared the full brunt of the crisis compared with their more “developed” counterparts in the West, and things are not as bad as the last Asian financial crisis, business owners are not taking any chances and are preparing for the worst. Their plans to expand market share and to improve their order books and sales have to be put on hold, at least until there are more certainties and confidence showing up in the economy and market. What matters most – there is a strong and sustainable rebound in consumer confidence, which largely depends on the state of the US economy. Take the local property industry for instance. Developers were doing relatively well with strong take-up for their projects until the US financial crisis unfolded in the middle of last year, thus putting a stop to the party. Kuala Lumpur was on the verge of seeing some “really expensive” residences, with price tags of up to RM30mil each, being unveiled when the crisis knocked off these plans from the drawing boards. Fans of these super-luxury residences will have some waiting to do before these products will be back in the market. Many of the developers have to defer their project launches while some opted to tweak and redesign their products to offer more affordable products. After almost three quarters of sluggish market and poor sales, it looks like things will not improve very much for the property fraternity until the other economic sectors, including the manufacturing and services sectors, start to show stronger signs of a rebound. The crisis also highlights the fact that property development is a highly cyclical business and industry players should equip themselves with all the skills and know-how to survive any market conditions. Besides having the right products in the right locations for sale, property development is also about good cashflow management. Developers need to be financially strong to ride out any cyclical “hiccups” as the deferment or slowdown of projects means substantial holding cost. Luckily, our developers have learnt their lesson well from the last regional crisis and many have healthy gearing ratios after having pared down their borrowings. Given the right market conditions, most of the developers will be able to spring back quite easily and start strutting their stuff again. A number of them are already making plans to launch greenfield township projects.